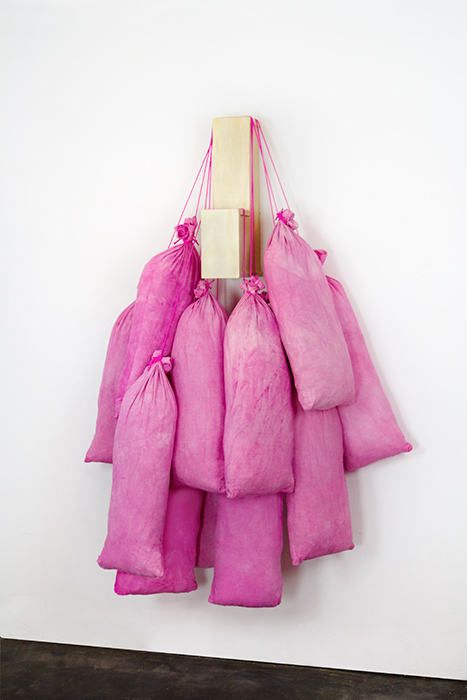 Pink sandbags and a few two-by-fours to keep them propped up. What shall we make of this? Out of the gate, I was perplexed and, honestly, not too interested. So, that’s my starting point in what turned out to be a rewarding encounter and learning experience when I met James Gilbert, whose solo exhibition, “Sledgehammer.Bullet.Bomb,” opens this evening at the Manhattan Beach Art Center. 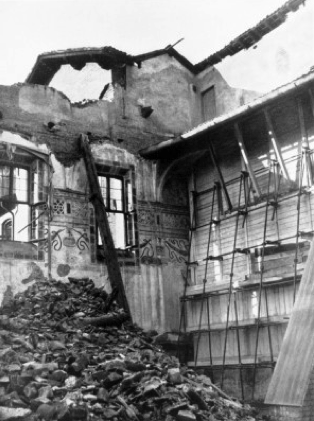 Curated by Homeira Goldstein and presented by Time 4 Art, the show contains nine new sculptures and two site-specific works, plus a video that addresses intentional destruction of cultural heritage sites. But is the work on view really serious or just playful, or both? Well, it’s both. Gilbert is a thoughtful artist who’s unafraid to push buttons and boundaries, with what I’m guessing is an impish sense of humor. We met recently over dinner at the exclusive Goldstein Café and talked far into the night. Does this series (“Sledgehammer.Bullet.Bomb”) relate to and resonate with what’s happening in the world right now? It’s hard not to think of what has occurred in Palmyra as well as ancient sites in Mosul, Nineveh, Nimrud, Hatra, and other Syrian or Iraqi cities. Even the Israeli policy of bulldozing the homes of alleged Palestinian terrorists seems to fall into this category. Still, the question might be lingering: Why the sandbags, the wood frames, and the color pink. What’s up with that? In case you’re skimming this article, the last sentence is worth re-reading. If you’ve got one handy, use a highlighter. 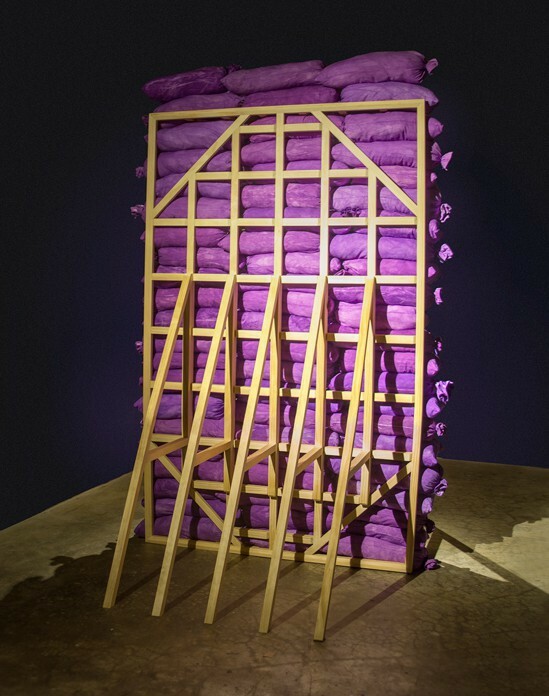 Gilbert references one of the pieces in the show, a buttress of sorts with sandbags. “I was thinking of a picture like ‘The Last Supper,’ and there’s always sandbags against it.” For Gilbert, the focus is not on Leonardo’s fresco, but rather what’s trying to keep it safe. Or, put mildly, the protector without the protectee. “I like the idea that these things that are protecting it are the symbol and then we move them off, and then they become their own individual kind of piece. Did your eyes linger over those words “becomes like a color-field painting”? 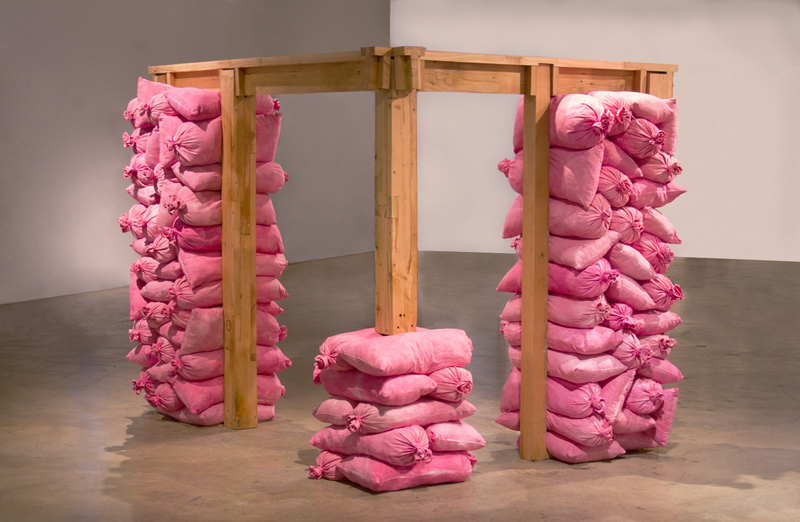 It certainly seems incongruous, sandbags as they might have been used during warfare, that is, aerial bombardment, to safeguard irreplaceable art or artifacts, with the color pink. But let’s listen in on what James Gilbert has to say. Lest it seem like a purely arbitrary choice, Gilbert then makes one thing clear: “Everything from the materials to the colors is always really relevant to me.” And with those words we are left to our own devices, as to whether the clash of battlefield and playground aesthetics work for or against our appreciation of the finished product. Each work, however, takes hours, days, perhaps weeks to construct. As some of his previous endeavors have shown, Gilbert opts for more rather than less. Well, for one it’s more impressive that way. You can look at one terracotta warrior, ho-hum, or you can gasp at an area the size of a football field that’s packed with hundreds of them. Gilbert mentions that there are still three more pieces he needs to finish for the show. The next morning he was back in the studio. James Gilbert was born in Southern California, but because his father was in the military the family was often on the move. It wasn’t just the visual arts that nudged him forward. Meanwhile, Gilbert has to sift through the same barrage of impressions–politics, pop culture, family, religion, war–that the rest of us encounter daily as well. It’s pretty much a nonstop flight, but what Gilbert is looking for are themes or subjects with a more permanent resonance. That’s where his journals come into the picture. Those that did were clearly more relevant. 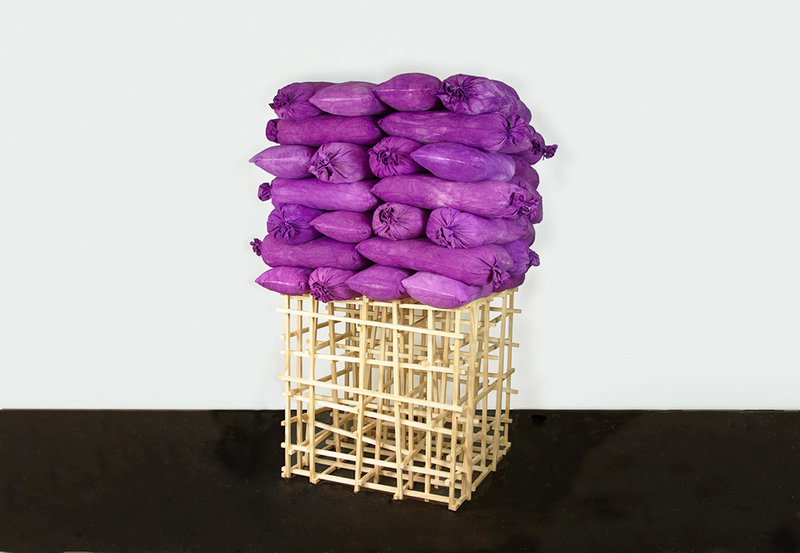 The themes that Gilbert explores with his most recent work are part of an important and ongoing dialogue about destruction and preservation, a dialogue not only about what we create or knock down, but about what we believe, what we hold dear, and who we are as a result. Pink sandbags and a few two-by-fours to keep them propped up. Well, that’s only the beginning, isn’t it?